Need a little boost during finals week? Check out the winners of the “Comedy Wildlife Photography Awards“! Read more from the New York Times Magazine HERE. The 2017 Pulitzer Prizes were announced yesterday and the award for excellence in Fiction went to Colson Whitehead for his novel “The Underground Railroad”. Whitehead’s innovative novel also received the national book award making him one of the few authors to have received both prizes in the same year. The Metropolitan Museum of Art recently announced that, “All images of public-domain artworks in the Metropolitan Museum of Art’s collection — about 375,000 — are now free for anyone to use however they may please.” They now fall under the “Creative Commons Zero” designation and are available via their website. 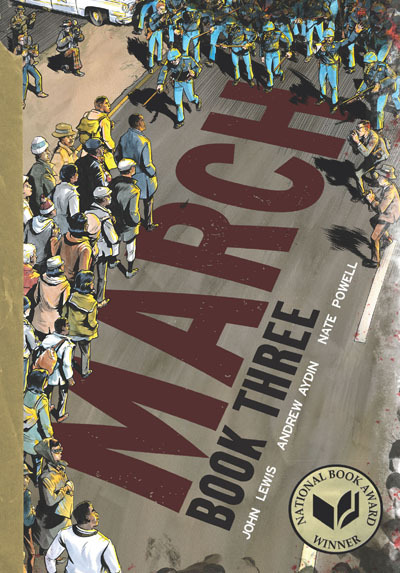 The 2017 Printz Award was given to “March: Book Three” by John Lewis, Andrew Aydin, and Nate Powell. The graphic novel is the third installment in the March series which tells John Lewis’ story about fighting for civil rights in the United States. Check out all three books in the series at the CA Library!